It’s a hot August day in the middle of a heat wave – one of the dog days for sure. The maintenance guy at my apartment complex just knocked on the door holding a tattered looking melleri. No, I’m not in Tanzania, I’m in Southern California and this was no stray. This was one of ours that has been missing for 6 weeks. She took free ranging a little too literally …. 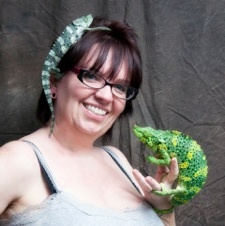 When I got my first chameleon - a sweet little female veiled - not all that long ago, I had no idea what I was doing. 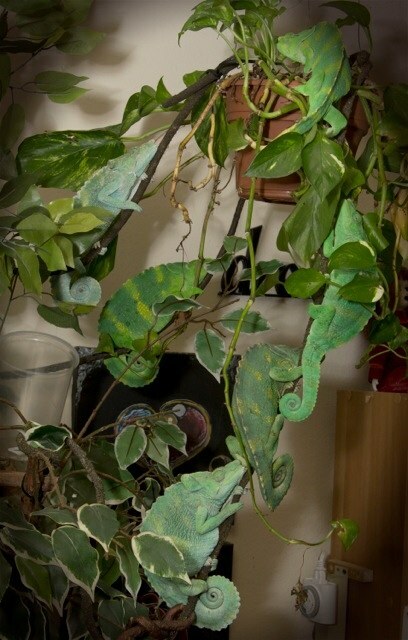 I was like many people with their first chameleon, researching after the fact and trying to figure out what I needed to do to take care of her. 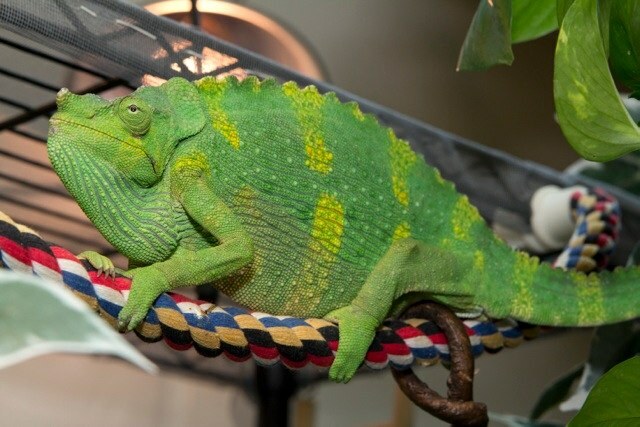 Undaunted by my ignorance, I quickly became infatuated with her and decided I needed more chameleons, more species, and of course, I would have to breed them! 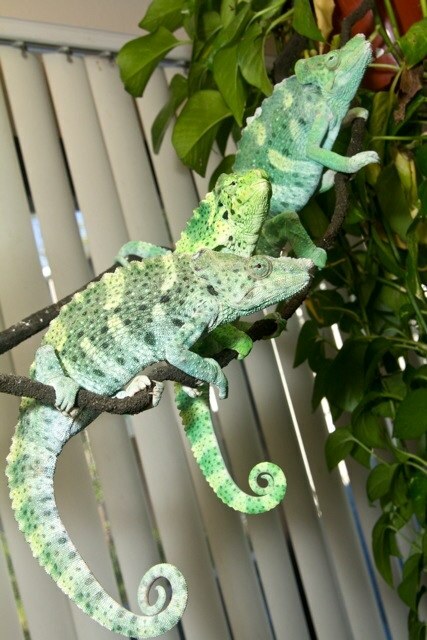 Fortunately, I am blessed with a husband who not only tolerates and supports all my crazy ideas, he loved the chameleons from the start and eagerly became my accomplice in acquiring and raising chameleons. We quickly had several chameleons of several species with cages all over and we were always trying to figure where to put more. And then I discovered melleri …. We had seen a few at shows and reptile stores and thought they were cool and bam! I woke up one day and decided I had to have a melleri. We were off to Home Depot getting stuff to build a large cage. To make a long story short, I built a rickety cage and got a melleri. Unfortunately, neither lasted long. My poor skills with tools were nothing compared to our inexperience with fresh WC chameleons. I don’t get discouraged, I just dream bigger. My next plan was to start creating a free range set up. I bought a large metal shelving unit and started building a free range with that as a base. It came out pretty cool – it was on wheels and full of plants and vines. It didn’t have lighting or a watering system but it was nice. 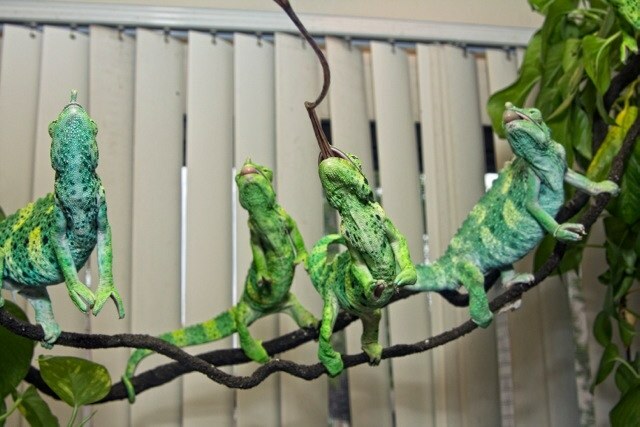 At first it was a free range for our caged chameleons so they could have time out of the cage. But I had a plan: A trip to Vegas to the reptile show where, hopefully, we would find a melleri. Luck was with us in Vegas. We came home with two lovely melleri. We began free ranging right in Vegas. We had some vines and branches wrapped around a hanging light in our hotel room and they spent the rest of the weekend hanging out there with quite a bit of time in the shower to get plenty of water. They continued free ranging on the way home, wandering around the car on the four hour ride from Vegas to Southern California. 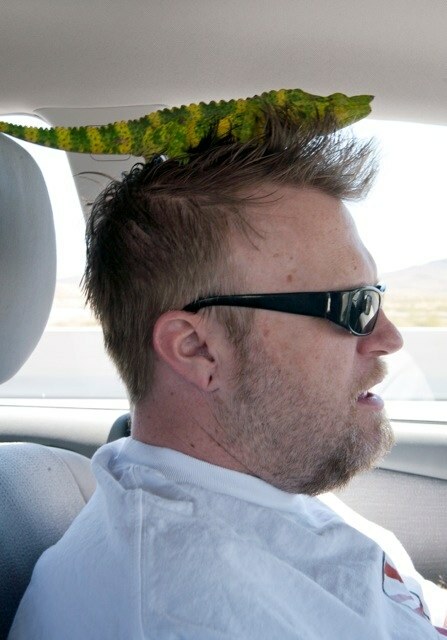 They spent a great deal of time riding on Jeremy’s head with their rostral pointing the way home. We were still beginners with WC chams and free ranging, but determined to not fail our two new family members, Jonsey and Tuners. We watered the heck out of them and re-read all the research we had studied after losing our first melleri. Lights and an AquaZamp misting system were added to the free range. Adjustments were made as we figured out what they liked. More plants, more vines, and more space was added. We were delighted by watching them and hand feeding them and watching them more. So we did what anyone would do. We started getting more. We created a smaller free range for new arrivals to keep them separate. We found a very large sweet melleri with all his feet and spine badly infected. Despite our best efforts and the help of our vet, he was past the point of being able to fight off the infection and we lost him. Even though we had him just a short time we cried like babies at his loss. At the next reptile show we found another young pair that we brought home. They were, and are, a comical duo with a sweet disposition. They lived on their own free range as they acclimated to life far from Africa. Soon more melleri found their way into our home and hearts. Some were rescues without a chance, some we were just lucky enough to find and bring home. Currently we have ten melleri living in a large free range that encircles our living room. It seems to continually keep expanding and our furniture keeps disappearing and becoming less important to us. Despite some of the rescues and issues of acclimating WC chameleons, we have been fortunate that most of our group has been fairly healthy and sociable. Our belief is that free ranging and companionship has eased the stress of acclimation for them. We recently brought home a fearful young melleri that had been kept in a small cage in a dirty garage with little to no interaction with anyone. He did not miss a chance to gape and lunge at anything and his previous owner was terrified of him. As the one elected to reach into the cage and extract him I could see why. I thought I might lose a finger! We brought him home and put him on the small free range where he could see the others and see us interact with them. At first, I thought it might be too much for him. He was severely underfed and dehydrated in addition to being terrified. But within a day he was hand feeding from us and, while cautious, was no longer lunging at us. Within a month he was healthy and had joined the others on the large free range. He is now one of our most sociable to the other melleri and well as to humans. That is one of the best parts of free ranging – the comfort they have with people. They eagerly watch anyone come through the front door. They have learned that people = food! New visitors think we are insane when they come in and see our living room full of trees with large lizards on them but the are quickly won over by the antics of the melleri as they eagerly take bugs from anyone offering them and will frequently walk right onto our guests. Even visitors with no experience with or a fear of reptiles are awestruck by the sight. And of course, the melleri are only to happy to entertain with their antics. Though for them it isn’t about entertaining, it’s just their life. Whatever life was like in Afirca, here they share space with other melleri, people, and occasionally other species of chameleons that wander over from their area. They climb on people and each other. If we are eating near them, they are likely to come see if it’s anything they can have too. While they haven’t grabbed food out of our mouths (yet) they do steal food out of each others mouths, usually while climbing over each other to get to it. Somehow, despite their daily rude behavior to each other, they end up each night sleeping nose to tail on the same branch. It sounds perfect doesn’t it? Like the kind of thing everyone can do? Well, it kind of is, but it’s also not without a lot of work and some risk. 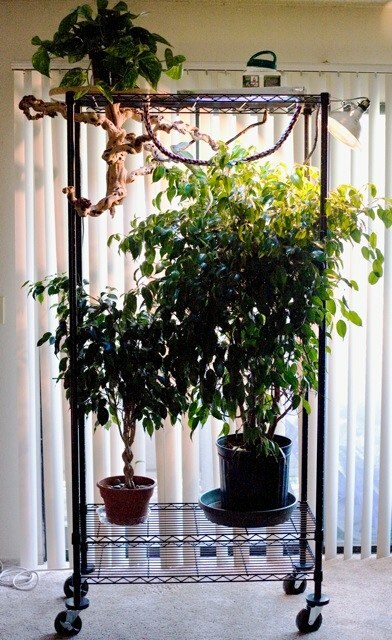 With chameleons, whether in cages or free range, water and drainage is always an issue. Especially in an apartment where there are certain choices I just can’t make – I am sure the neighbors don’t want our used chameleon water draining into their apartment! Not to mention, chameleons are impossible to litter box train! Sure they tend to go in the same spot, but each chameleon has a favorite spot and sometimes they just go where ever they want. So, between water, poop, shedded skin, bug debris, and leaves it is a challenge to keeping the carpet protected and things clean. Clean up is a daily, not weekly, chore. Add the challenge of providing adequate and safe lighting, plant care and feeding and it is quite a job. And all those are the easy things! Chameleons will get out of a free range. They wander in the wild so no matter how large and wonderful a free range may be, they will sometimes decide to go for a walk. We’ve also noticed that the melleri consider EVERYTHING part of their territory and will get out of the trees we have assigned to them and go sit on the book shelf, or on the cord behind the TV, or even in the closet. Fortunately, they all don’t wander on a regular basis, most of them do actually stay on the free range and even the wanderers usually stay on or close to the free range area. But when they don’t it can be tragic. 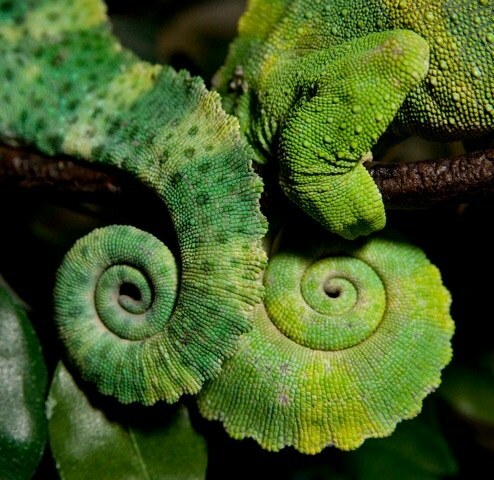 Providing for their safety is one thing, providing for the safety of smaller chameleons is another. We had two small T. hoehnelli hatchlings in a baby bin near the free range. Because we had kept babies in there previously with no issues I felt it was safe for them. After a trip to the grocery store one afternoon we came home to find a melleri sitting above the baby bin and one hoehnelli missing. I will always regret being so careless about that. Even after moving the remaining baby to a cage and removing the bin, that same melleri went back to that spot for weeks. That is not surprising since the wanderers know where we keep the crickets and dubia and will go try to get into those bins as well. If the story of the missing hoehnelli is not bad enough, we were feeding the group one afternoon and noticed our largest melleri, Lucky, was missing. Not too uncommon, as she is one that likes to wander a bit. We started searching the usual spots and couldn’t find her. We had our back door open to let a breeze through and of course checked our back patio, not really thinking she would have gone out there. And even if she had, there is a fifteen foot drop to pavement below into the parking area … she wouldn’t jump or fall from there. It just didn’t seem possible. As the day went on with no sign of her, we became increasingly worried. We went out to search the parking area and the entire apartment complex. Could she have fallen? Was she hurt? Did someone pick her up? I was still hopeful she was inside the apartment – maybe hiding to lay eggs? She had shown no signs of eggs but I was holding onto hope and optimism. The next morning we began making lost posters and hanging them around the complex. We talked to neighbors, the people who worked here, the gardeners who came weekly, we went out in the early mornings to look for her, hoping to catch her waking up. We went out at night with flashlights hoping to see her sleeping. We didn’t know if she was alive or dead, if someone found her and kept her, we checked lost & found ads, the animal shelter, knocked on doors and handed out fliers. Days turned into weeks. We began to lose hope. August was here and it was hot and dry. If she was even out there could she survive? There are cats and crows and hawks in the area. And then came the knock at the door. The maintenance guys were all standing out there and one was holding our Lucky. They saw her walking down the sidewalk around the complex and grabbed her. They all knew how much we had looked for her and were nearly as happy to have found her for us and we were to get her back. So we have a happy ending for Lucky. And we’ve made some adjustments to prevent future escapes and ensure the safety of both the melleri as well as the other chameleons. There are still risks and there is still a lot of work to do on a daily basis. Is it worth it to us? Yes. And we feel it is worth it to them.